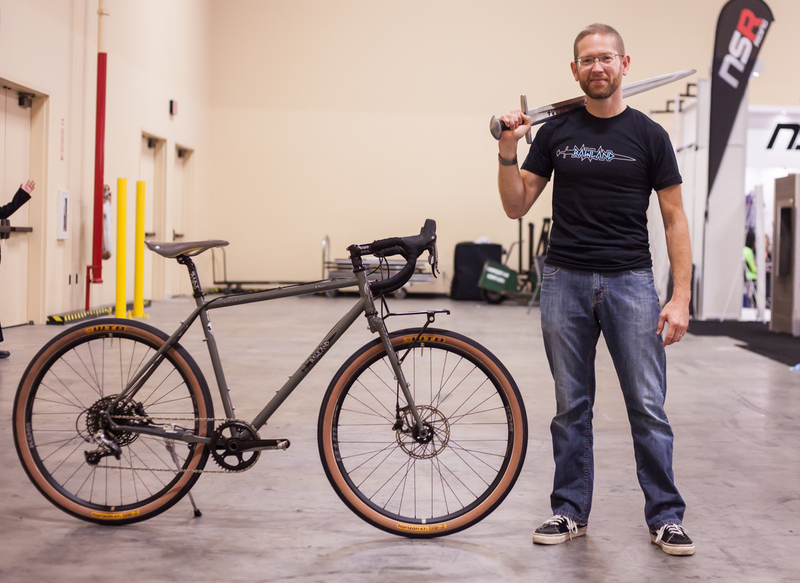 Sean and Anna Virnig founded Viking-inspired Rawland Cycles back in 2007 while riding the expansive gravel-road network in Minnesota. Since then, the brand has moved west, transplanting into two cycling hotspots on the West Coast: the San Francisco Bay Area and Portland, Oregon. 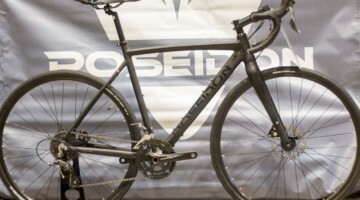 At Interbike, the brand was on hand for the very first time to unveil a pair of all new steel bikes that have big intentions to leave the pavement behind. The ULV and the RAVN are the meat and potatoes Rawland’s 2017 lineup. 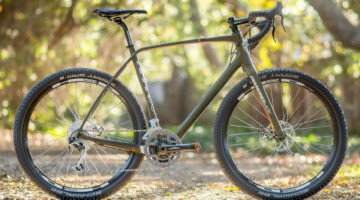 The ULV is a heavy duty 27.5+ dirt destroyer, while the RAVN more of a smooth operator that looks to make light work of gravel roads and mild singletrack. We met up with the Rawland crew to take an in-depth look at the latter of the two bikes. Gravel roads be warned, there’s a new kid thundering through the backcountry. The RAVN is a bike that was built for gravel and dirt, with an inclination towards longer outings. 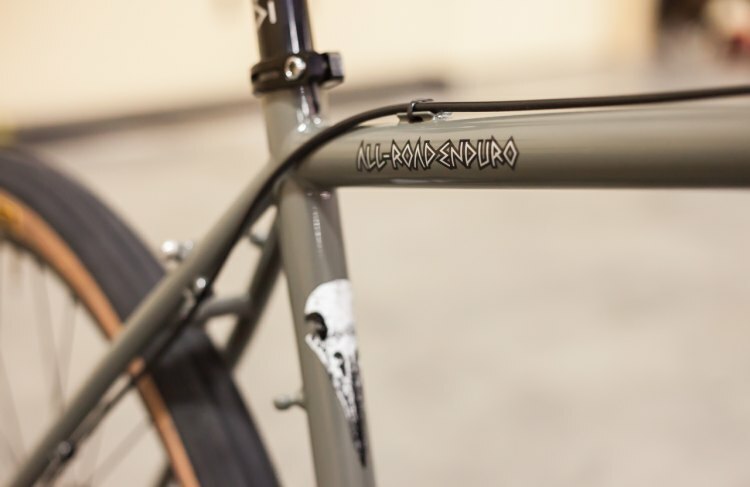 The frame is made from custom triple-butted, heat-treated 4130 chromoly steel. Tubing is Rawland’s own design, and carries the title “Rawland Staal” – staal is a Dutch word that translates to steel. The top tube and down tube feature a .8/.5/.8/1 profile. 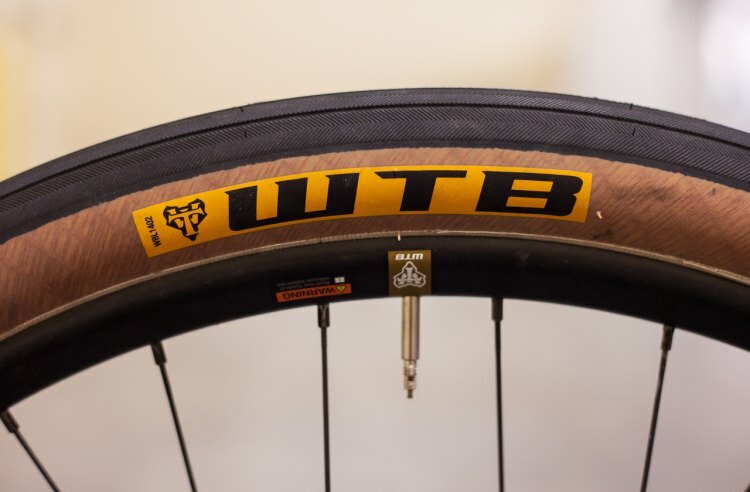 When implemented, this profile becomes a tube with a wall width of .8mm at the seat tube junction, tapering down to .5mm towards the center of the tube, and thickening back out to 1mm where it connects to the head tube. 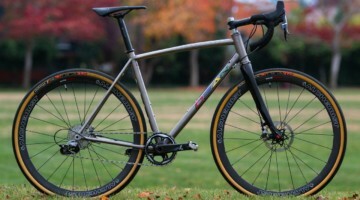 This makes for a stronger livelier frame without the extra bulk of straight gauge tubing. The RAVN’s custom-like appeal doesn’t stop at the tubeset. 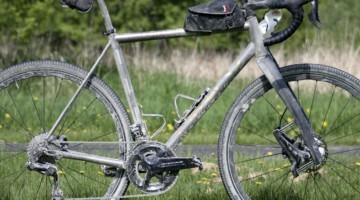 The frame is home to a full outfit of rack and fender eyelets, three water bottle mounts, a chain hanger and a pump peg. The frame also gets an ED coating for rust prevention while simultaneously saving riders the chore of doing their own frame saver treatment. 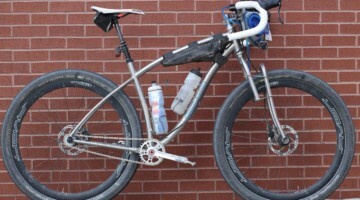 Rugged designs continue to the Ravn’s fork. The segmented steel fork has its own array of specs, including rack and fender mounts at the crown, mid-blade and dropouts. 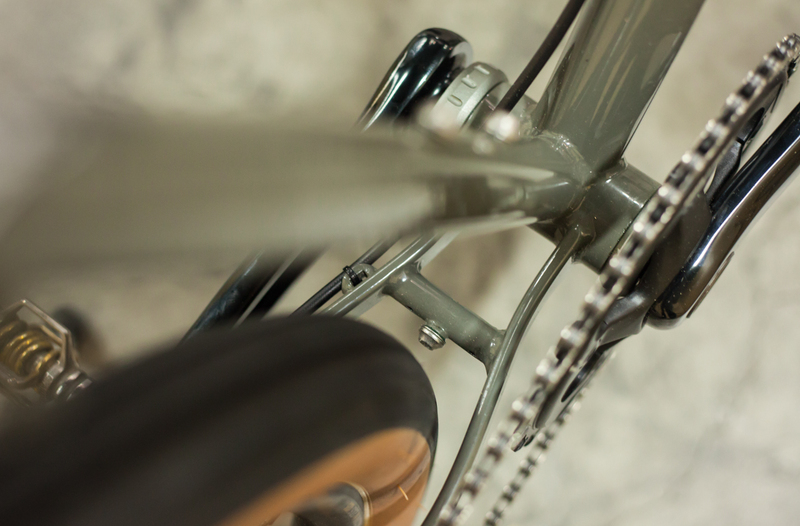 The drive side blade features and internal routing path for dynamo wiring should riders choose to set the bike up for long rides under the cover of night. Designed for front loading, the fork has 30mm of trail for increased stability when weighted down, yet this trait also helps eliminate any to overlap when riding with fenders equipped. The RAVN we saw at Interbike has a build kit that is fairly similar to the stock bike that is available to consumers. The main difference between the two is that the show bike is set up with 650b wheels. The stock build comes with 26” wheels with massive 54mm Panaracer Driver Pro tires. The change in setup for the show was like done to demonstrate the bike’s ability to happily run both wheel sizes. A Rawland rep informed us that the bike can even run on 700c wheels, and that he was able to narrowly tuck the new 700x44c Compass Snoqualmie Pass tires into the frame. Other non-stock parts include the Chris King headset and White Industries hubs, as well as the substitution of an offset seatpost. The stock build kit is composed primarily of SRAM drivetrain and brake components mixed with Rawland’s own house brand Radioverks components. 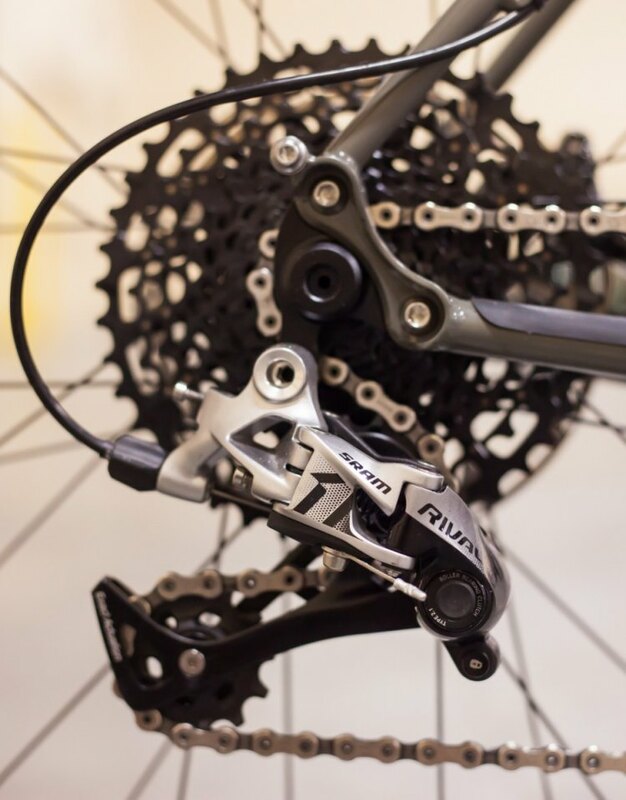 The Ravn gets a 10-42t SRAM cassette and Rival 1 shifters, brakes and rear derailleur. Power is transferred through a Rival 1 aluminum crank and 42t ring. Minimum rotor size on the RAVN is 180mm. Combine that with 12×142 and 12x100mm thru-axles and the RAVN starts to look more like a mountain bike. It won’t spook easy when the route gets steep and rough. The cockpit is comprised of Radioverks components, a name that can also be found on the hubs, skewers and seatpost clamp. The stock bike sees those Radioverks hubs laced to a pair of Alex MD40 32h wheels. The included Radioverks Rando rack gives the RAVN added versatility in its capacity for a large handlebar bag. The RAVN is available for pre-order with delivery expected by the end of 2016. Offered in a size range from 54-60cm, complete bikes retail for $2,999 USD while a frameset can be had for $950 USD. Claimed frameset (frame and fork) weight for a 56 is 7lbs, 1oz. 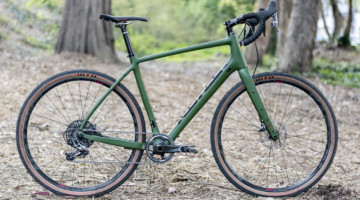 It’s certainly not the lightest all-road bike on the market, but like the Viking iconography that is intertwined with the brand, the RAVN was designed to accompany a more adventurous conquest.